Dimensions (HxWxD): 24"x 16"x 19"
If your searching for a shredder that provides more security with micro-cut style, the Swingline DM11-13 micro cut jam free shredder will meet your security needs expected from a single departmental shredder. The shredder works quickly and easily keeping information secured by shredding them into tiny micro cut pieces of 1/8”x1/2”. The DM11-13 micro-cut shredder delivers non-stop jam free, continuous duty shredding. It shreds 11 sheets in one cycle. The Swingline DM11-13 shredder senses the amount of sheets fed to the machine and alerts the user with a red light when shredder exceeds the capacity. This helps in preventing paper jams. 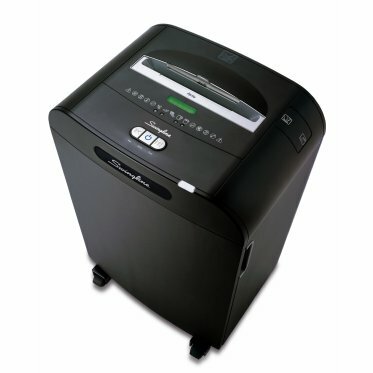 This level 4 (P-5) paper shredder meets shredding needs of 5-10 individuals and can be installed in any office department. The Swingline DM11-13 micro cut jam free shredder ensures the best performance for years to come as it is equipped with an Intelligent SelfOil and Self Clean feature that keeps the cutting shafts clean and lubricated. Moreover, it also delivers super quiet shredding operations and has an integrated feature of Intelligent Power Save that goes into sleep mode if left idle for sometime. The Swingline DM11-13 shredder has a pull out frame waste bin of 13 gallons and comes with a bin full indicator. Delivers continuous jam free shredding. Can shred paper, paper clips, staples and credit cards. Inform user through red light if it exceeds the maximum limit of sheets to be shred in one cycle. Quiet shredding operations make it ideal for shared workplaces. Built with illuminated status symbols. Intelligent Self Cleaning cutters that remove build-up on the cutter and eliminate paper jams. Equipped with Intelligent SelfOil feature. Integrated automatic wake up feature. Bin full indicator to inform user when the waste bin needs to be emptied. Warranty of 2 years with on-site service.